In late 2003 Colchester Boys Grammar School in Essex, United Kingdom, reached from the Northern hemisphere to the South, to make a remarkable Christmas gift. They were collecting money to donate buckets filled with food, school stationery and toys or books, each one costing about ninety rands (7-8 pounds depending on the exchange rate), to be delivered to the Joe Slovo squatter camp on Christmas Day by Children of Fire. For boys from a comparatively affluent city to even be interested in families living in corrugated iron shacks on the edge of Johannesburg, South Africa, is due largely to the efforts of one pupil, Duncan Brisk. Duncan, then aged 13, has been supporting two boys from the camp for a long time with part of his pocket money. He has visited them in their home and was shocked when their shack was razed in August 2003. That fire left two thousand people destitute and Children of Fire made massive attempts to assist them to rebuild their lives. 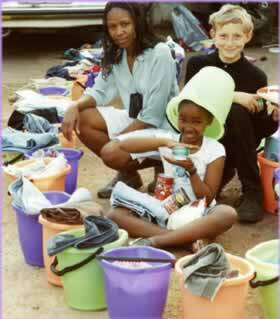 The charity even made small bucket-hampers for some of the families at that time. But the number of people affected was too high and the number of fires in other squatter camps stretched our resources too far. So that Christmas, four months after the fire, some people were still living shells of lives - just walls, a roof and barely any material comfort inside. Buckets are an essential part of squatter camp life - to carry water back from the communal taps for drinking and for washing with. Buckets also help to extinguish fires if people raise the alarm quickly enough. The kindness of schoolboys and their families living so far away, make a tangible difference. Add to this the efforts of Mike Downes, a man from Duncan's home village of Wivenhoe, and more gifts or buckets are likely to arrive in the dusty suburb of Johannesburg where Joe Slovo lives. People who wish to pledge financial support to the Christmas Bucket campaign should email us on firechildren@icon.co.za and, if they are UK-based, we will forward their details to Duncan.